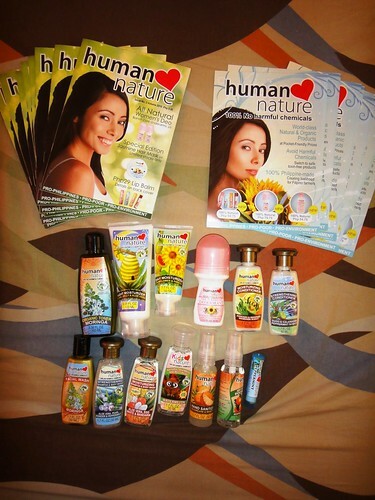 Last September I signed up to be a dealer of Human Nature products. My reasons are (1) for personal use and (2) as another means of income. My sister's co-workers are my first customers. So far so good. The orders doesn't come week after week which I don't mind. Believe it or not, I'm happy that people are starting to recognize these organic products. My sister is happy with their Moisturizing shampoo and conditioner as well as their Tomato Facial wash and Toner. On my part, I like their Jasmine Hair Mask and their Feminine Wash.I'm currently using both of these products. I'm planning to buy a body and foot scrub in my next purchase to pamper my skin since going to a spa can be so expensive. Now I'm waiting for Human Nature to release their new catalogue in time for the Christmas season. I'm planning to give some of their products as gifts for my friends and god children. As much as possible, I want to give gifts that can be of use by the receiver. I don't want my gifts go to waste because it's broken.